Brad Seng won his 27th career NLRA series feature Saturday night at the Viking Speedway in Alexandria, MN, while rain claimed night two Sunday night. On Saturday night, Brad Seng, driver of the No. 12S S&S Transport MB Custom, took the lead from Cody Skytland, driver of the No. 75 Langdon Implement MastersBuilt by JMR, with 10 laps to go, and lead the remainder of the event. Jeff Wildung, in the Veit Companies No. 50 was running fourth with three to go when he went pitside, while Ricky Weiss in the No. 7 Derrick's Sandblasting Bloomquist and Zach Johnson, driver of the No. 73 Shaw Trucking Pierce swapped the third and fourth positions after Wildung's exit. Tom Corcoran at River Cities in July of 2013. The NLRA Season starts at the Viking Speedway tomorrow night, Saturday May 23rd and Sunday May 24th. Photo courtesy of Traci Palya. 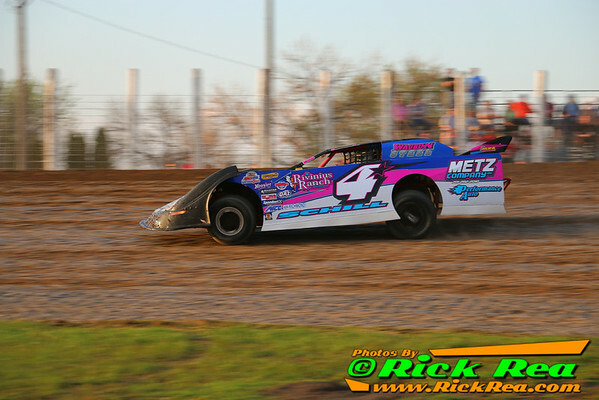 Winner at River Cities last night, Joey Pederson in the Dahlstrom Motors No. 7P at the River Cities opener on May 3rd. Pederson won the most recent visit by the NLRA to the Greenbush Race Park in Greenbush, MN in 2011. The series is scheduled to race in Greenbush twice this year. The NLRA Season starts at the Viking Speedway on Saturday May 23rd and Sunday May 24th. Photo courtesy of Traci Palya.